Is this really a Reissue? Looks more like the official release. "Technicolor" and "Clear" were big tunes here on the West Coast 80's and still are a must for every electro fan. In my opinion, the intros alone set off DJ careers with doubles playing back to back for new variations and scratching material. These tunes were all part of the early hip-hop/electro/breakdance scene here in Cali. Metroplex was part of the essential records for learning how to mix and for GenX getting into this whole DJ thing before hip-hop turned to the slower beats of the 90's. Atkin's was a huge influence - one of my favorite tracks. Has been in my crate since 1987. Detroit radio had all this on full rotation for years. Usually played at 45 by the jocks. 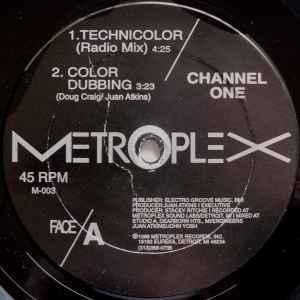 Words by Juan Atkins from an interview I did with him circa 2005: "Technicolor was a collaboration with a guy here in Detroit; it was more fun than politically driven, just about the colors and combination spread from colors." it always sounded like a spin-off of "Clear" to me!! Technicolor is very percussive electro, with Magic Juan getting very carried away with vocal samples (t-t-t-t-technicor!) old-skool orchestral stabs, a very detroit bassline, and a sequencer riff lifted from Kraftwerk's It's More Fun To Compute. It's a rich mix, but he gets away with it. This track is a special one for me. First heard it ~1990 before really knowing what techno is, loved it back then and surprisingly rediscovered recently again: an organically-robotic tune standing the test of time, dynamically broken into stiff chunks while retaining moving funkyness hidden within bassline, teh-ni-ka-la! Originally came out as a PROMO.Quality early Electro/Techno from the master himself,and co-written by Doug Craig (Carl Craig's cousin. )This is on the same sort of lines as R9 (CYBOTRON)with the trademark bassline that he's used so often in his early material.